Flying Colours has announced that the third phase of the Canadian company’s long-term expansion strategy has begun as work is under way on the first round of infrastructure development at its St. Louis, MO. facility. The project will include the addition of a new building, the upgrading of several back shops, a doubling in size of the cabinetry workshop and a workforce growth of 30%. The new Flying Colours KSUS edifice is conveniently located at the end of the Spirit of St. Louis Airport runway, and gives easy access to the existing Flying Colours hangars. When the doors open in mid-December, a further 40 300 square feet will be added to the Flying Colours Corp. north American footprint. The new site’s layout has been specifically designed to improve productivity, efficiency and streamline the work flow. When the doors open on the bright, white open-plan interior it will house a state-of-the-art cabinetry workshop which more than doubles the size of the existing St. Louis wood-working shop. The fully refurbished facility will comfortably accommodate a CNC room for design, an expansive machine room with a range of detailing tools, two dedicated temperature controlled spray booths, insulated buffing and sanding sections, two varnish and paint mixing rooms, as well as assembly, framing and finishing areas. A unique feature of the new unit is the installation of an enclosed “curing” room, used to bake the varnish and paint onto monument cutouts. 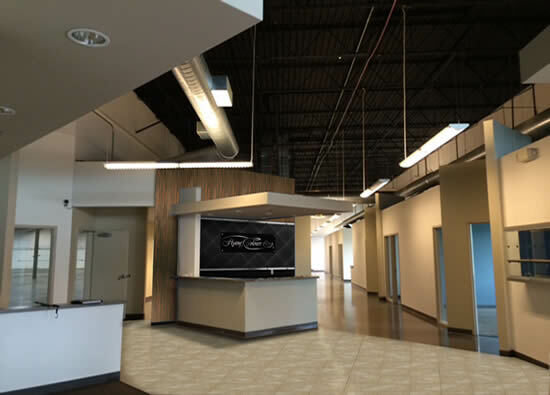 Upgraded upholstery, avionics and engineering workshops will also be accommodated in the modernized building. A series of offices for production control planning and production management teams, as well as conference rooms, storage areas, and further offices will complement the workshops and provide comfortable, stylish customer meeting areas too. To gear up for the opening in mid-December, Flying Colours is already busy recruiting a team of over 70 workers, and is making the most of the rich source of talent in the St. Louis area. “Our new building gave us a blank canvas on which we have designed and created the ultimate cabinetry workshop. It will look as pristine as an operating theatre when we open, provide a great working environment for our existing and new team members, and a superb location for customer visits. We are very excited about our first phase of growth here,” said Sean Gillespie, Executive VP, Flying Colours Corp. This expansion phase represents a multi-million-dollar investment from Flying Colours which committed to the project having won a significant set of cabinetry projects, for which work will begin in Q1 2018. With the additional building the Flying Colours Corp. KSUS’ footprint will exceed more than 100 000 square feet in total.